Is life on this planet getting better? When it comes to the progress of nations, how do you measure what matters most? There’s wealth, there’s health, there’s basic human freedoms. These criteria, and others, make regular appearances in a variety of international rankings, from the Better Life Index to the Sustainable Economic Development Assessment and the World Happiness Report. But a new study takes a different approach. The Happy Planet Index, which has just published its 2016 edition, measures health and happiness not in isolation but against a crucial new gold standard for success: sustainability. The formula goes something like this: take the well-being and longevity of a population, measure how equally both are distributed, then set the result against each country's ecological footprint. In this calculation, the most successful countries are those where people live long and happy lives at little cost to the environment. So which countries are they? They're not the wealthy Western countries you’d expect to see, or even the progressive Nordic ones that normally bag the lifestyle laurels. Instead, a list of the top 10 (the index ranks 140 countries overall) shows that when it comes to people’s ability to live good lives within sustainable limits, Latin American and Asia Pacific countries are ahead of the crowd. There’s one country that stands out: Costa Rica, which tops the ranking for the third time. It is the happiest and most sustainable country on Earth, according to the Happy Planet Index. So, what is it doing right? A recent Gallup poll found the Central American nation to have the highest level of well-being in the world. It also has some of the longest-lived people: life expectancy there is 78.5 years – older than in the US. But what places the country time and again at the top of the index is that it delivers all this health and happiness while using a mere quarter of the resources that are typically used in the Western world. How does it do that? Chiefly through a strong commitment to the environment: 99% of the country’s electricity supply is said to come from renewable sources, and the government has pledged to make the country carbon neutral by 2021. Other factors include robust investing in social programmes such as health and education, with public money that has been all the more plentiful since the abolition of the national army in 1949. Wealthier Western countries tend to score highly when it comes to life expectancy and well-being, but the high environmental cost of their way of life sees their ratings plummet. The US, for instance, has one of the largest ecological footprints in the world. Of the Scandinavian nations, meanwhile, only Norway appears in the index’s top 20. Compare country scores in more detail via this interactive map on the Happy Planet Index website. 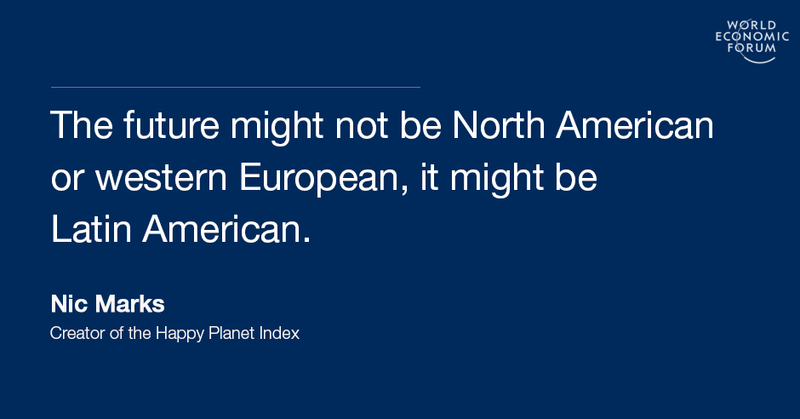 Which countries are the most optimistic?